Hanging out in a sycamore tree on a beautiful day. Photo by Danny Lyons There are many reasons why people climb trees. For some, it's a way to relax and "get away from it all". 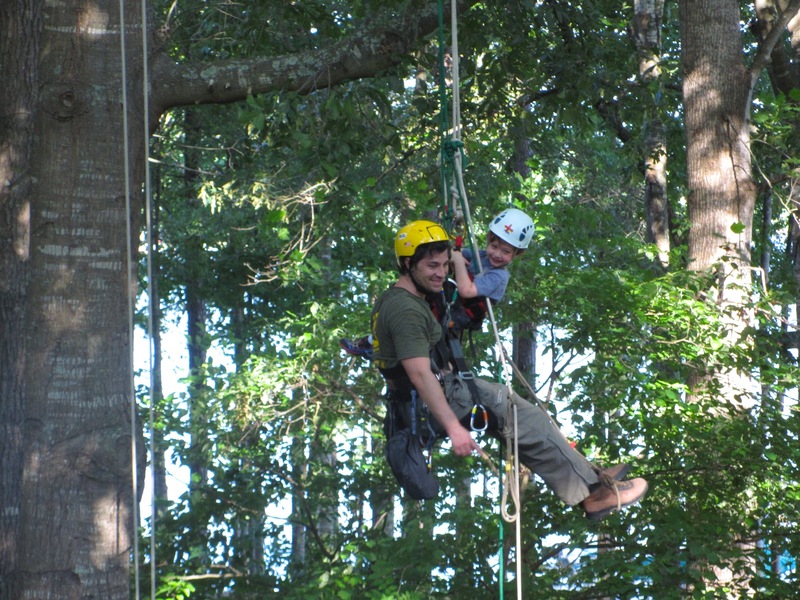 For others, tree climbing is a career choice, such as tree work or canopy research. No matter what your purpose, TCI and our colleagues can provide tree climbing instruction to anyone who wants to learn, either in courses held in Atlanta or through other tree climbing schools where the instructor's expertise is more appropriate to a student's needs. In these pages you will find a complete description of TCI's recreational and entry-level tree worker training programs. Please read them carefully, and then call us for further information. When An afternoon in "Kokopelli" with Tree Climbing Planet in Portland, Oregon. (Photo by Scott Schieber)you were younger, you climbed a tree, yes? Most people did. You probably used your arms and legs--and your knees and armpits once in a while--to scramble up the branches. Recreational tree climbing with a rope and saddle is a little bit more complicated than that, but just as much fun, and certainly less risky! These days, when most children and adults are spending far more time inside than out, recreational tree climbing is an activity that immediately brings every climber "back to nature." Once you're hooked onto a rope with a saddle around your waist and a helmet on your head, the world slows down. You begin to relax as you go aloft, and lo and behold, you're feeling like a new person! Suddenly you might be seeing your climbing tree with different eyes, and you'll never look at a tree the same way again. You might be smelling the fragrance of a recent summer rain, or hearing the wake-up calls of birds looking for mates or protecting their young. No matter how "old" you are, you'll find that tree climbing is a safe and unusual way to spend an afternoon! Try it out! Beginners' climbs are always laughter-filled, and our private tree-climbing group outings are reputed to be the best way to celebrate a special occasion. If you come to our school with the people you work with, you may learn something about each of them that you didn't know before! Whatever the reason or the season, we look forward to seeing you under the canopy of a beautiful climbing tree! Welcome to the TCI Gear Rater! — and others — here!TCI's Gear Rater lets you see how other climbers rate the gear they're using. Are you unfamiliar with a particular type or style of gear? Not sure if it's right for you? Check back often for new evaluations and/or new gear. You may be surprised what you'll learn here! Readers and reviewers will find rating guidelines for each type of gear on each category page. Star ratings are the average of all factors except type of use and frequency of use. These two factors tell you more about who the reviewer is and under what conditions the gear is being used. Take these into account as you evaluate whether the review is useful to you for a particular type of equipment. Please remember: All visitors to our site can read gear ratings, but only people who are registered can post reviews and/or use our "Gear Rater Form" to submit new items for review. If you're not registered but you are a climber with gear you particularly like or dislike, please register and and tell our community about it. The Gear Rater will become an invaluable tool for all climbers--recreational and professional--as more and more of you express your opinions about various tree climbing equipment. Basic information about tree climbing gear can be found in our "All About Gear" section. Overall user ratings for saddles are based on an average of durability, comfort, ease of use, and portability. Type of use and frequency of use averages are listed for information purposes only. More information about saddles can be found in our "All About Gear" section. For ease of use, we have divided this category into Carabiners, Screw Links, and Snaps pages. Please use the menu at right to view these items. Overall user ratings for carabiners are based on an average of durability, ease of use, safety, and strength. Type of use and frequency of use statistics are for information purposes only. More information about carabiners, screw links, and snaps can be found in our "All About Gear" section. Overall user ratings for screw links are based on an average of durability, ease of use, safety, and strength. Type of use and frequency of use statistics are for information purposes only. More information about screw links can be found in our "All About Gear" section. Overall user ratings of pulleys are based on an average of durability, technical skill required, ease of use/set-up, and safety. Type of use and frequency of use averages are shown for information only. More information about pulleys can be found in our "All About Gear" section. More information about throw weightsr can be found in our "All About Gear" section. More information about line placement devices can be found in our "All About Gear" section. Information about throwline cubes and other line placement equipment can be found in our "All About Gear" section. Overall user ratings for cambium/rope protection gear are based on an average of durability, technical skill required, ease of use, and portability. Type of use and frequency of use averages are for information purposes only. Information about branch savers can be found in our "All About Gear" section. WE ARE UPDATING THIS SECTION. Please come back in a few days. Overall user ratings for ascending and descending tools are based on an average of durability, technical skill required, ease of use, safety, strength, and portability. Type of use and frequency of use statistics are for information purposes only. Information about combination ascending/descending devices can be found in our "All About Gear" section. Overall user ratings for lanyard positioning devices are based on an average of durability, technical skill required, ease of use, safety, strength, and portability. Type of use and frequency of use statistics are for information purposes only. Information about lanyards can be found in our "All About Gear" section. Treeman's blog is a special place on the Tree Climbers International site where you can read what TCI's founder has to say about all kinds of things. His posts are funny, informative, and interesting! 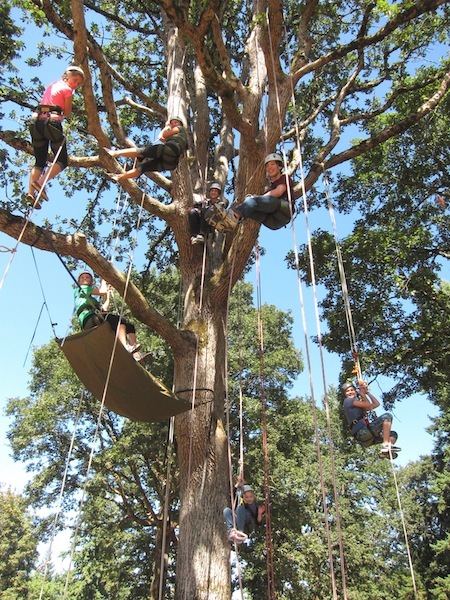 TCI needs your support to be able to serve the rapidly expanding international tree-climbing community. Join our organization and help us grow! Notification of new issues of TCI's newsletter, "Tree Climbing Online"
History, Mission Statement, Membership Benefits for Tree Climbers International.